Can’t afford a trip to France?! Me either. It’s a good thing that Le Bougainviller Hotel owner Bruno Scontrini did an incredible job of bringing that French charm right to Kampala. 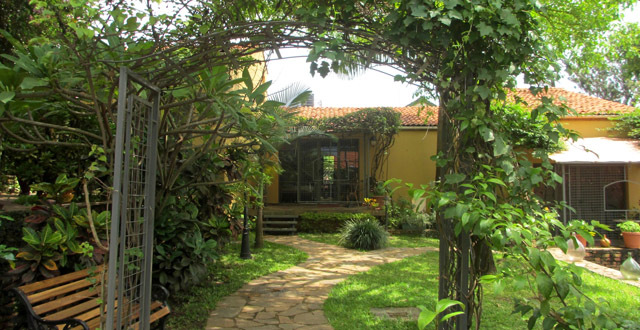 This boutique hotel is located in the heart of the Bugolobi neighborhood near Luthuli Avenue and the new shopping center, Village Mall. The main portion of the hotel opened in 2005 and they later expanded across the street in 2009 to add more rooms and a lovely French restaurant and wine cellar. I suppose it’s the unique decorative details of this hotel that really capture my attention. Le Bougainviller Hotel is different from any other hotel in town. For instance, each room is labeled with a French name, like “Jacques Brel” or “Carmen” for example. Many of the door windows throughout the hotel grounds are made with colorful stained glass detailing and you can’t miss the golden birdcage just outside the reception desk! 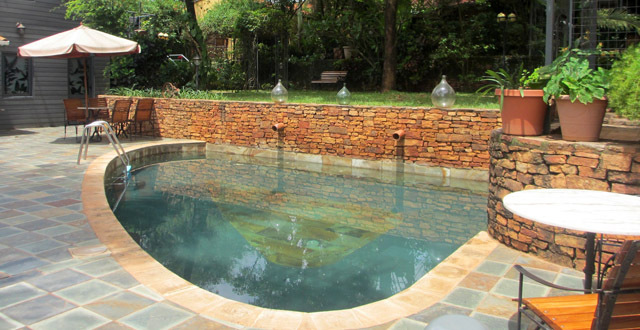 For an ideal leisurely afternoon, they have a small pool and patio section to keep you cool during hot Kampala days. The hotel grounds are covered with lush palm trees, ivy-wrapped doorframes, tropical plants, and colorful flowers. Winding stone pathways lead the way to each room, the patio, the breakfast cafe, and reception desk. As a side note, they are in the process of updating their breakfast café and adding an additional storey to serve as a chic roof deck patio, but don’t let the current renovations scare you off! I stopped by in the middle of the afternoon and it was quiet and relaxing. The structure portion is already set so there shouldn’t be any noisy construction going on! Le Bougainviller Hotel consists of 24 rooms total which breaks down to five Standard Rooms, five Duplex Apartments, and the remaining 14 rooms are medium-sized Suites. 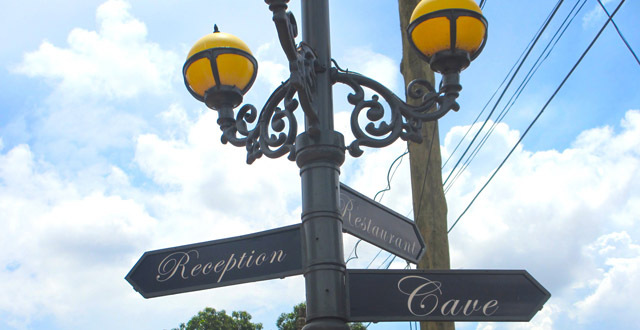 Your stay includes a Wi-Fi access in your room and full breakfast each morning. I’ve actually come for breakfast a few times and it usually consists of a fresh fruit plate, unlimited coffee, basket of baguette bread with butter and jam (to die for! ), and an egg dish ordered how you like it. Now, don’t go ordering anything too fancy: think more like scrambled, fried, or Spanish omelette. The following room rates include VAT and assume single occupancy. Each additional person will cost you $20 and if you need an extra bed in the room, you’ll be charged $15. The Standard Room runs $110 per night. The next step up which includes a bit more space and couch is the Suite Room at $120 per night. Finally, their two-story Duplex/Apartments are the largest accommodation option and run $130 per night. They are significantly larger than the Standard and Suite options and offer a full kitchenette and bathtub. It is a great value for that price! They also offer a great discount for extended stay visitors. If you stay 10 or more days– 5% discount, 20 or more days—10% discount, and 30 or more days—you’ll receive a 15% discount per night of your stay. In my opinion, Le Bougainviller Hotel is a great accommodation choice for guests or visiting colleagues who prefer not to stay in hectic downtown and want a more unique experience compared to the large chain hotels. Le Bougainviller is quaint, quiet, and undeniably charming!